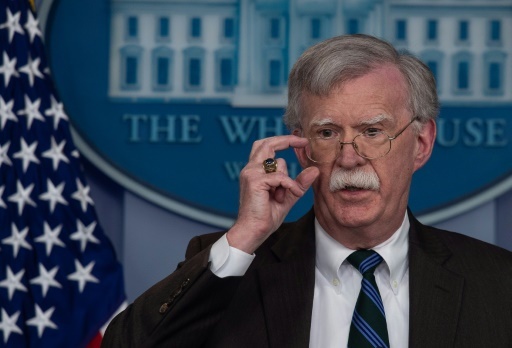 Washington (AFP) – John Bolton, the influential White House national security advisor, said Tuesday he will not listen to the tape recording of Saudi dissident journalist Jamal Khashoggi’s murder because he doesn’t understand Arabic. The gruesome tape — a key piece of evidence in the murder allegedly ordered by US ally Saudi Crown Prince Mohammed bin Salman — was distributed by Turkey after Khashoggi was killed inside the Saudi consulate in Istanbul on October 2. But Bolton told journalists that there is no point in him listening to the events unfolding in the recording because he can’t understand the language. “I guess I should ask you why you think I should, what you think I’ll learn from it,” he responded to a journalist. After press reports that the CIA was pointing the finger directly at Prince Mohammed, Trump issued a statement saying that US-Saudi relations and oil market stability were too important to rock over the scandal. After repeated denials of any knowledge about Khashoggi’s disappearance, Saudi Arabia finally admitted the 59-year-old had been murdered at the mission in a “rogue” operation. Featured Photo: AFP / NICHOLAS KAMM. US National Security Advisor John Bolton says he won’t listen to the tape recording of Saudi dissident journalist Jamal Khashoggi’s murder because he doesn’t understand Arabic.